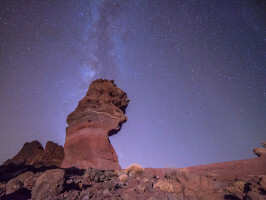 Come with us for an unforgettable evening of stargazing in the rugged landscapes of the Las Cañadas del Teide National Park. Watch the sun go down and see the ridges and rocks of this otherworldly landscape gradually turn different shades of pink, ochre red and purple. Then once darkness has fallen, an expert astronomer will point out the different constellations to you as you enjoy a complimentary glass of Cava. At over 3700m high, the Teide is the highest mountain in Spain and an active volcano to boot. 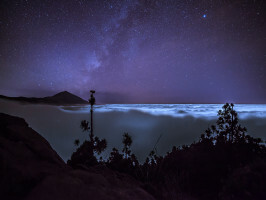 The skies and atmospheric conditions here are among the best in the world for astronomical observation and the landscapes are simply breathtaking. The scenery here is truly amazing, like something from another planet. Weird rock formations of different hues of red, ochre and brown stand out stark against a cobalt sky. And looming above it all the impressive snow-capped peak of the Teide, the magic mountain of Tenerife. You'll be picked up from your resort in the late afternoon and driven high up into the craggy wilderness of this National Park, making several photo stops along the way. 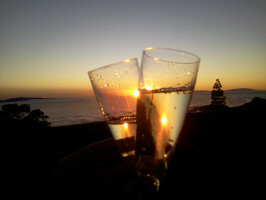 Then it's time to toast the sunset with a glass of bubbly Cava in your hand. Watch the setting sun fire this landscape in a blaze of colour in a truly humbling experience. Then once darkness has fallen we'll continue to a special viewing station where your knowledgeable guide will map out the night sky for you, constellation by constellation. 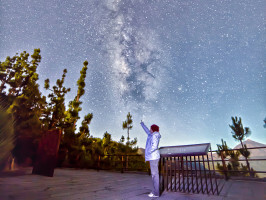 The air is so clear you'll feel like you can reach and touch the myriad twinkling stars. A night to remember! Pick up starts at 2.30pm. The Dinner option is only available for the tour in English at a restaurant in the National Park. Slow roasted pork fillet in Palm syrup, served with vegetables of the day and Dauphinoise potatoes. Star time : 14:30 hrs approx.